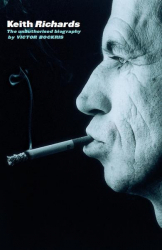 byte.to Keith Richards The Unauthorised Biography - Filme, Spiele, Musik, Bücher und mehr kostenlos downloaden. Victor Bockriss much admired biography of Keith Richards has been constantly revised since its original publication, now with an additional 12,000 words for a new edition of the Omnibus Press paperback that brings the story up to the present day. First published in eight countries in 1992, at that time Keith Richrds had stood in the shadow of Mick Jagger for thirty years. Then, as a result of Victor Bockris biography, Richards was put in the spotlight and emerged as the power behind the throne, the creator, the backbone, and the soul of the Rolling Stones. Here are the true facts behind Richards battles with his demons: the women, the drugs and the love-hate-relationship with Jagger. His struggle with heroin and his status as the rock star most likely to die in the 1970s. His scarcely believable rebirth as a family man in the 1980s. Illuminated with revealing quotes and thoughtful insights into the man behind the band that goes on forever.